Charles “Bud” Gibbons (1947– ), Boy on Bike, acrylic, 47 x 37 in., acquired 1987, Friends of Art Collection for Pittsburgh Public Schools. Pittsburgh artist, Bud Gibbons, advises young people to be creative. Gibbons is an Associated Artist of Pittsburgh, and he teaches at Penn State New Kensington. His painting, “Boy on Bike” was purchased by the Friends of Art. Gibbons has always been inspired by another artist, Winslow Homer. The acrylic painting, “Boy on Bike” has different shades of colors, and it is a big painting so people can look at it and realize it is realistic in style. I believe the boy in the painting looks like he is staring at something like a car or a bird. The boy on the bike in this art work could be the artist as a child. In my opinion I think the artist, Gibbons, wants to express his feelings in this work so people can enjoy looking at it and discussing the painting of a boy on his bike. Bud Gibbons, the artist, used paint for this painting. Yes, the media is important for this type of art work because you can show different shapes and light. The genre of this figure painting is realistic. The painting is about a little boy riding a bike on the country road. This boy may be waiting for an oncoming car. I like the painting because it looks real! I don’t really get art. Taking a closer look at Gibbon’s “Boy on Bike,” my impression is that the work is not that important. The canvas is large. The subject is a boy on his bicycle, and yes, it is called a “figure” painting. I don’t think the acrylic is realistic, and to me, it is not the very best work of art I have seen. Again, I don’t really get art! As you can tell by reading my first paragraph, I have little or no feelings about the artist’s work, and it does not appeal to me. The research I read on Bud Gibbons was uninspiring. I’m not good at art, and it bothers me that I’m not talented in art. I don’t know how to change this feeling. I do know that my art teacher tries everything she can to interest me. Bud Gibbons is a famous artist who lives in Pittsburgh and works at Penn State University New Kensington. The painter, Gibbons, spent a lot of time making the landscape in “Boy on Bike”. In my research about the artist I read that he calls this type of portrait, figure painting, because of the only boy. The painting shows a summer scene and is a very realistic painting. The artist used many colors and a lot of shading in this large work. He made it large for a good view. This acrylic was painted on a sturdy canvas. I think this is a wonderful painting. Gibbons is very creative with acrylic paints. I also think the Friends of Art made a good choice in purchasing this art work for the Pittsburgh Public Schools. In my opinion, I think Gibbons just had an idea about a boy and his bicycle. I don’t think he had a reason to paint this particular portrait. The Pittsburgh artist, Bud Gibbons, works at Penn State University New Kensington campus. He is an art teacher at the University and he is a working artist as well. Gibbons uses acrylic paints for the figure painting of “Boy on Bike” that now hangs in the library of Banksville Elementary School thanks to the Friends of Art. The size of the canvas for this work is very large, and the syle is realistic. The colors appeal to me, and the paint texture on the canvas looks hard.I kind of like this art work, and I think the boy in the painting could be in a town or on a highway; it’s summer, and I really like how Gibbons signed his name in the grass. My personal opinion about this work is that I consider it an awesome painting because the bike looks real, and the boy looks like me! I think the artist’s message might be that summer is a good time to ride a bike, and it is very warm in the summer. I like the painting, “Boy on Bike” by artist, Bud Gibbons. I think he first sketched a picture of a boy on a bicycle and then he painted the boy and his bike on a canvas. Gibbons used acrylic paints and the canvas for this work is of medium size. The style of painting is realistic. I think the white paint helps the viewer to see the bicycle. Gibbons calls this work, figure painting. I can’t tell too much about the texture of the paint because the art work is very high on top of a book case in our library. 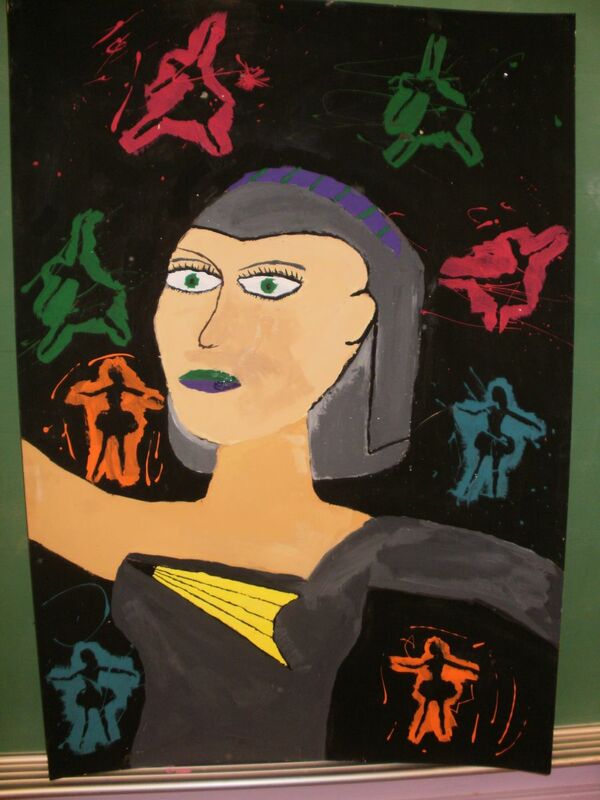 The Friends of Art purchased this painting for students in the Pittsburgh Public Schools. Bud Gibbons, Pittsburgh artist, teaches at Penn State University of the New Kensington campus. 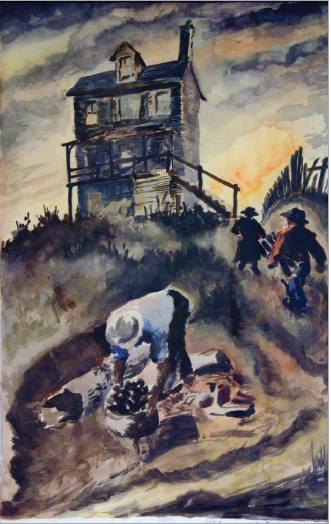 He says that his work has been inspired by another artist, Homer Winslow. The Friends of Art purchased this painting of a boy on his bike for the students in the Pittsburgh Public School where it now hangs in the Banksville Elementary library. The Friends of Art began purchasing art work in 1916. I think this painting is a good one. The background seems to be painting in the summer time. Gibbon’s canvas is very large so viewers can see it. I think it looks like the artist finger-painted onto the canvas. I really like the “Boy on Bike” figure painting because of the use of so much of the same color paints. I don’t really think Gibbons had a particular message. Pittsburgh artist, Bud Gibbons, teaches at Penn State New Kensington. He uses acrylic oil paints because of how it looks on stretched canvas. Gibbons lives in Pittsburgh. His painting, “Boy on Bike,” was purchased by the Friends of Art and given as a gift to the Pittsburgh Public Schools. The figure painting now hangs at Banksville K-8. “Boy on Bike” is a large painting. To me, the texture looks like it was finger painted by Gibbons. The presentation of this painting is realistic, and it looks to me that the boy on the canvas is turning to see if there is a car behind him, or he heard something and turned to see what it was. I think this art work is astonishingly beautiful. I love this painting of a boy on his bike. Bud Gibbons is a painter. He teaches at Penn State University at the New Kensington campus. I don’t know when the “Boy and Bike” was painted, but I do know that his painting is hanging in my school because the artist is a member of the Associated Artists of Pittsburgh, and his work was purchased for the Pittsburgh Public Schools by the Friends of Art. The artist, Bud Gibbons, used acrylic paints as the media for his work, “Boy on Bike”, because the subject of the painting is a boy and he is on a bike, and the artist says that acrylic paints help him tell about the subjects or figures in his work. The artist shows a summer day, and perhaps the artist himself likes bikes. In the painting, it looks like the sun is shining on the boy’s head. It also may be that Gibbons painted the neighborhood in which he lives. Shadows in the background show daytime. The painting is a realistic image of a boy on his bike, on a road, with the boy turning his head to see something. I want to thank the Friends of Art for purchasing this figure painting. I believe that the artist, Gibbons, created this painting because he likes bicycles and he wanted to make his feelings known. Bud Gibbons has always been inspired by another artist; Winslow Homer. Gibbons is from Pittsburgh. The “Boy on Bike” was painted with acrylic paints and the artist used different brushes for different parts of the art work. A large brush was probably used for the background, and smaller brushes for the grasses. The boy may be waiting for his friend. I like this painting because of the beautiful shadows. Thank you to the Friends of Art for purchasing this work for the Pittsburgh Pubic School students. Bud Gibbons is a painter. He teaches at Penn State as a full time career. Gibbons was always inspired to become a painter by another painter, Winslow Homer. The artist, Gibbons, created a figure painting of a boy on his bike that is very real looking. The colors in this work are both soft light and Gothic dark. The boy seems to be having a bike ride that was fun. There are patterns of shadows and reflections in this work. To me, the descriptive colors show summer season. I believe that the artist, Bud Gibbons, was trying to inform us that in his painting, “Boy on Bike,” that the figure on the canvas was enjoying his ride, and he might be going somewhere. Bud Gibbons is a painter, and the students at Banksville K-6 School enjoy his painting of a boy on a bike that is now hanging in our library. Gibbons is a very good artist, and he is also an art professor at Penn State New Kensington. The Pittsburgh artist used acrylic oil paint for “Boy on Bike.” Gibbons uses a lot of detail in this figure painting, and I think he based this work as a summer scene. The artist may have been inspired by thinking of himself when he was a little boy on a bike on the road somewhere. I think he paints with passion. This work is very large with a lot of detail, and Gibbons signed his name on the bottom of the canvas. I love the painting. It inspires me to be an artist when I grow up. To me, it looks like the boy heard something like a car, and looked, and then wanted to ride back to his house which may even be across the street in front of him. The artist, Bud Gibbons, used paint to describe his thoughts. Gibbons paints large because you can see from far away, the boy on his bike. I think that the boy on the bike is looking to make sure that a car is not behind him. He is also viewing the landscape behind him. This is a realistic painting because Gibbons must have seen this boy on the bike. I am noticing the details; even the mark on the sock is noticed. I like this art because I like the outdoors too. I ride my bike, too! Critiques by the following students: Antonio H., Ian D., and Jose A. We like the painting. We like to see the bike and how the artist painted the boy and his bike so realistically. We’ve never seen a painting like this before. It is nice to see the boy as he looks up and down the street. The artist has put much focus on showing the boy learning to ride just as we all had to focus on learning to ride our bikes. We also think there is a lot of feeling portrayed in this art work, and much enthusiasm. The boy in the painting could actually be the artist, Gibbons, as a child. As a follow up project with the “Taking A Closer Look” collaboration between Pittsburgh Public Schools, Associated Artists of Pittsburgh, and the Friends of Art organization, four student Art Ambassadors from the Pittsburgh Carmalt Academy of Science and Technology wrote personal responses to their experience as student researchers, presenters, instructors, art critics, and teacher leaders. The “Taking A Closer Look” program has been funded for two years by the Milton Fine Foundation and the Frick Education Fund of the Buhl Foundation. Dr. Och, principal of Pittsburgh Carmalt, met with the student Art Ambassadors to assist them with planning and implementing an integrated art and writing experience regarding an adopted painting from the “Learning Lab” at Greenway Gifted Center. The student Art Ambassadors’ presentation for a group of fifth graders at Pittsburgh Carmalt was the culminating activity of their research and study about the artist, Henry Lisi, and his 1948 “Hill Scene” landscape which is one of the art works in the Friends of Art Collection currently hanging in the school. For the students to write this essay, I, along with the rest of my group, had to think like teachers and create a lesson plan. Also, after the essays were written, we, not the classroom teacher, had to check the written work and select the best one for publication on the “Taking A Closer Look” web site. In my opinion, the Art Ambassadors course was very enriching and allowed us to see how important art is in education. With all of the proposed budget cuts, the government needs to know how important art is, and I think this experience did just that. Picture the Friends of Art (FOA) purchases (a collection of original Pittsburgh art beginning in 1916) hanging in every home school for student opportunity of studying art…………….like myself! I am an Art Ambassador, and being one through the Pittsburgh Gifted Center from the start of the 2009 school year to the current day means that I have the great honor to study artwork from the past to present in this Pittsburgh Public School art collection. As an Art Ambassador, this means taking classes to do just that and spreading my knowledge of the pieces to others who either do not understand the art, or want to learn more about the Friends of Art and Associated Artists of Pittsburgh who recently celebrated their one hundredth birthday! And, furthermore, on May 10th, 2011, fellow peers of mine who attended the Art Ambassador program teamed up to create a presentation to a fifth grade class at our school, Pittsburgh Carmalt. We were able to select, from the FOA Collection, the painting, “Hill Scene”, by an artist named Henry Lisi. We narrowed down our selection from seven choices to meet the needs of the assignment the fifth graders were to do afterwards – a narrative based on the painting. Finally, from teaching others about art after learning more myself, I stepped into the role of many people; thinking like an analyst and acting like a teacher. I realized how important sharing wisdom and art - ¬ from one generation to the next – actually is. Lanie W.’s reflection: “After becoming a member of the Art Ambassadors group I was introduced to an amazing opportunity that allowed me to participate in a teaching session for a classroom of fifth graders. During the teaching session we introduced an artist named Henry Lisi who painted, “Hill Scene,” a famous work showing how people during World War II found a new beginning by immigrating to the United States. Even though I did not teach this portion of the lesson plan I did present to the class the writing prompt for their consideration. I had to do a colossal of things in order to present in an organized, articulate way. First, during the presentation, I offered important aspects to the fifth graders about writing an essay using dialogue. I explained to the students that dialogue can help any author bring their characters to life in a narrative story. Additionally, during this beneficial experience, I learned how to explain a rubric that pertained to a narrative writing piece. In order to keep the students’ attention, I had to learn to speak in a tone that was intriguing and interesting about the topic. Although I was not a member of the Art Ambassadors and this project from the start, I was very happy to know that I could be included in the planning and presentation of the “Taking A Closer Look” program. This opportunity allowed me to experience something truly amazing that could help me fulfill my dream of becoming a teacher. I thank my classmates, Marie, Daria and Fadi along with Dr. Och and Dr. Sheahan for having me participate in this art and writing collaboration. The four student Art Ambassadors reviewed all of the fifth graders’ narratives using a 20 point Fictional Narrative Rubric which included focus, content development, organization, style and conventions for a total of 20 points. According to the student Art Ambassadors, the winning essay by Laurel Bristow, demonstrated extremely creative writing focusing on a made-up story that could have happened, highly imaginative setting and characters with a well-developed plot leading to a richly entertaining story. Using the Rubric Guide, the Art Ambassadors observed Laurel’s use of rich dialogue that added to the story about the people in Lisi’s painting, and acknowledged that her ideas were connected in a logical way and showed good transitions and theme. Laurel Bristow’s story about “Hill Scene,” revolves around two characters, an old house, trying to survive life’s hardships, and the value of truth and hard work. My name is Laurel. I am a little girl and my mother’s name is Elizabeth. We are a poor family in 1947, but that’s about to change. First, my mama and I cannot afford clothes. All we have are a few old, ragged shirts, and a few pairs of dirty pants; no shoes or nothing. My mama was always searching for a job, but could never get one. One day, mama was about to give up. “I can not take it no more, always searching for a job, but always getting turned down; I give up,” mama said, shouting. Then, Mama and I got a lantern and headed off to our journey. When Mama and I got to his old house we noticed him planting in his front yard. “Mama, what should we do? He’s right there in his long yard?” So, Mama and I were thinking. I said, “How about we run quietly?” We did. We ran real fast, but also real quiet. We made it to the house, and there we saw a door different from all the other doors so we investigated. Inside the door we saw that it was filled with coal; I mean, stacks and stacks of it. Finally, we grabbed as much as our hands could carry. We also put coal in our shirts. We then ran to our house. When we got home we went to the town and sold the coal. Mama and I were very rich. We thought our life was going to be great until Mama and I were sitting at home. Mama was polishing her new diamond ring and it was so quiet you could hear a pin drop. The farmer slammed through the door, and caught us. “I know you took my coal,” he yelled angrily. “How dare you frame us. Where is the proof?” Mama said. School Students in the After School Program at Westwood Elementary engaged in many discussions about the Pittsburgh artist, and former Pittsburgh Public School teacher, Daniel Bolick. Their teacher, Susan Carlin, encouraged them to take a closer look at Bolick s Portrait #24 that is hanging on the wall in her classroom. Carlin adopted this acrylic painting, and three others, for Westwood student enjoyment and appreciation from a unique art collection started in 1916 by the Friends of Art for the students in the Pittsburgh Public Schools.Principal, Denise Littles-Cullens, and teacher, Susan Carlin, agreed to meet with Dr. Patricia A. Sheahan, arts educator and a member of the Associated Artists of Pittsburgh, to discuss a project whereby a group of students would take a closer look at original, regional art from the Friends of Art Collection and participate in a writing experience as well as an artistic response. Writing Response and Interpretive Painting by: Jaclynn K.
Daniel Bolick is an artist who painted portraits of many people. He used acrylic and latex paint in his portraits. Bolick painted many different subjects which portrayed many emotions. He was an art teacher in the Pittsburgh Public Schools for many years, and he traveled all over the world looking for inspiration. Bolick painted Portrait #24. The media that he used to create this very colorful portrait was acrylic paint. The subject of Portrait #24 is a young street fighter from Nicaragua. I believe that this is a wonderful piece. I like it because there is a lot to look at when viewing it. I really like the look of the splatter paint technique used by Bolick. I enjoy the artists lively use of color. It seems that most of the subjects Bolick paints are sad. I believe that the message that Mr. Bolick is trying to portray in Portrait #24 is Help me. Maybe the artist feels as if the subject is reaching out for help. This young person seems very sad. I can relate to this subject because I too feel like a young warrior when I am playing sports. Writing Response and Interpretive Painting by: Olivia J.
Pittsburgh artist, Dan Bolick, was a former teacher in the Pittsburgh Public Schools. He enjoyed 39 years of working in the classroom before retirement. He then began to concentrate on his own artwork. Bolick painted with acrylic paints, and he mainly painted portraits. He is an Associated Artist of Pittsburgh who creates many portraits of individuals who are experiencing great sadness and despair, and the use of color in his portraits helps show these extreme feelings. Bolick s painting, titled, Portrait #24, is only one of many portraits. Writing Response and Interpretive Painting by: Jeremiah R.
Dan Bolick is a veteran art teacher of 34 years. Bolick grew up in Pittsburgh, Pennsylvania. This Pittsburgh artist typically uses acrylic paints in his work. He is a portrait painter, and a member of The Associated Artists of Pittsburgh. One of the pieces Bolick created is called, Portrait #24. 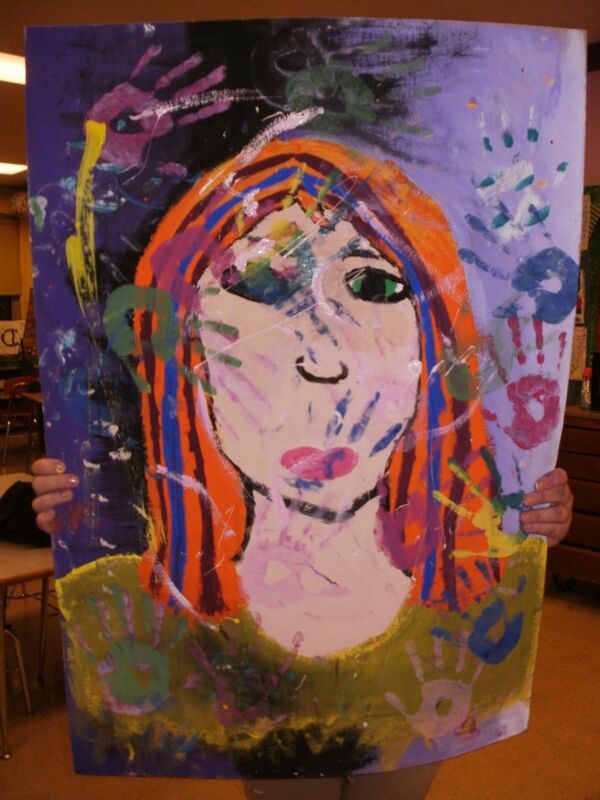 This portrait was purchased by the Friends of Art, in 2007, to hang in Pittsburgh Public Schools. The Pittsburgh artist s inspiration for this portrait came from his visit to Nicaragua where he saw young boys street fighting. He painted a portrait of one of those boys. Portrait #24 is bright, acrylic paints. I really do not like the genre of portraiture, but I do like the vivid use of colors which draw attention to the painting. Bolick painted this acrylic to tell the story of how a young man in Nicaragua felt during the eighties. He took a photograph of the young man which he later painted. I have a hard time relating to the subject because I do not fight all the time. I do wonder why the young warrior looks so sad. I believe that this young man is courageous for fighting. There is also a look of anger in this painting. Even though I am not a big fan of portraits, I feel as if Portrait #24 expresses a message of intense anger, sadness, and courage. Writing Response and Interpretive Painting by: Kimberly S.
Dan Bolick is an artist from Pittsburgh. He was an art teacher for 34 years. Bolick is an inspirational artist. This veteran teacher taught in many middle schools across the Pittsburgh Public Schools. He was an inspiration to many young inspiring artists. The Pittsburgh native is a portrait painter who mainly uses acrylic paints. His paintings capture many emotions of his real people subject matter. I think that the message in Bolick s Portrait #24 is to stay strong. This portraiture artist used a cold color background in the painting to produce a sad feeling. In contrast, he used a warm and vibrant splatter painting to create an almost warm and uplifting feeling. I like the use of a sad subject matter to make you feel energized with warm colors against a sad face. I like this portrait because it creates mixed emotions just by altering colors against contrasting color schemes. The warm colors really make the cool colors stand out. The subject of Portrait #24 is a street fighter in Nicaragua. Bolick s attention was drawn to a street fight between young boys. Portrait #24 is a portrait of one of these young urban warriors. I can relate to this subject because I too have everything that is thrown at me randomly and I also have to learn to deal with it. I like the subjects that the artist, Bolick, chooses to paint because he is willing to paint realistic, sad things which are unique. Writing Response and Interpretive Painting by: Mhauri G.
Dan Bolick is an amazing artist. This inspirational painter is a Pittsburgh native. Bolick was an art teacher in the Pittsburgh Public Schools for over thirty years. This veteran artist created many works of art. Bolick paints with acrylic and latex paints and he used a splatter paint technique. He paints in the genre of portraiture. In Portrait #24 , the former Pittsburgh art teacher, captured a defeated look and emotion. The subject matter of Portrait #24 is a young street fighter. Bolick painted this canvas to capture the feeling of a young warrior. The artist took a photograph of this young fighter on a visit to Nicaragua. The acrylic paints that Bolick used in this painting give it a shiny appearance. My favorite part of Portrait #24 is its colorfulness. Each of the colors in the painting appears to stand for something unique and different. The background blue colors seem to represent water around at all times. Portrait #24 is a very powerful painting. Unlike the young, urban warrior in Portrait #24, I consider myself very calm and peaceful. This young man does look very hopeful and appears as if he may have a bright future. I think that the artist, Bolick, is trying to express emotions within himself as they relate to his subject matter. I believe that this painting sends a message of hope even after defeat. Writing Response and Interpretive Painting by: Akansha P.
Dan Bolick was an art teacher in Pittsburgh. He painted many colorful portraits with the use of acrylic paints. Bolick painted people who spent time in prison when they were wrongly accused of crimes they did not commit. This Pittsburgh artist s subjects show deep emotions. Portrait #24 is a painting of a young teenage boy in Nicaragua. The genre of the painting is a portrait and it is splatter painted with many colors. The artist s use of color is very creative. I think that Bolick chose this subject because it was colorful to paint. He also wanted to show the emotions of sadness and thinking. He captured this through the use of color and through the young warrior s expression. When I look at the portrait I feel sad for the boy and I also feel good, as if I should be nice to others. Writing Response and Interpretive Painting by: Veronica K.
Daniel Bolick is a Pittsburgh artist who taught in the Pittsburgh Public Schools. He is now a member of the Associated Artists of Pittsburgh. He paints in the genre of portraits and uses a splatter paint technique to show intense emotion. While in Nicaragua in the 1980s, Bolick photographed a young street fighter. In 2006 he used this photograph for inspiration in a painting he titled, Portrait #24. The genre of this painting is a portrait. 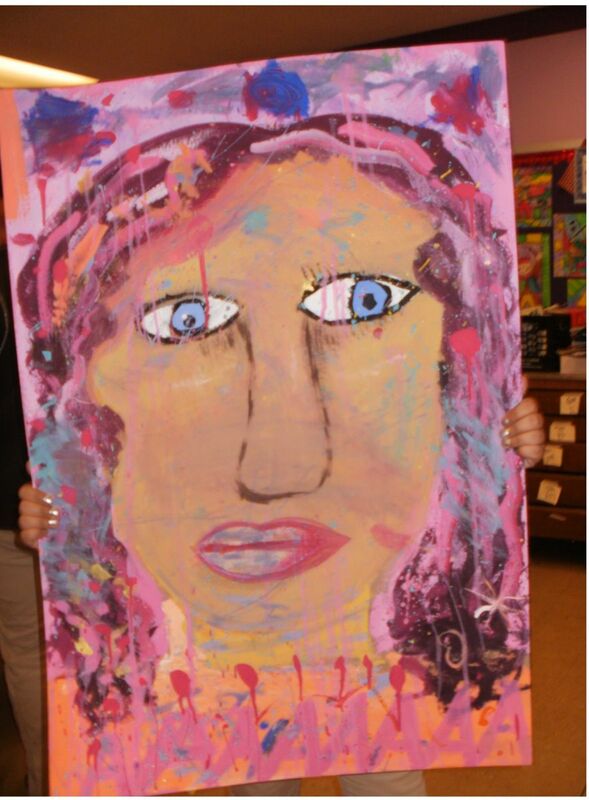 This painting was purchased by the Friends of Art to be hung at and appreciated in Pittsburgh Public Schools. I like Bolick s painting, Portrait #24, because it captures a lot of emotions even though the subject s face has only one expression. I also like this painting because all of the patterns and colors used by the artist show the boy s intense feelings. To me, I think the message Bolick is trying to portray through Portrait #24, is that life is hard and not everyone lives in a good environment. I feel that Bolick did a good job portraying what the boy might go through every day. This painting is more than a work of art, it is a story. Writing Response and Interpretive Painting by: Vivian J.
Dan Bolick is a portrait painter who works mainly with acrylic paint to tell stories. Bolick is from the city of Pittsburgh, Pennsylvania. He was an art teacher for 39 years at several schools in the District. This veteran teacher taught all ages during his many years of inspiring children in the way of art. He worked mainly in acrylic paints but also used charcoal and pencil for many of his series of art work. Portrait #24 is an acrylic styled painting which is splattered with many colors. This painting is a portrait as stated in its title. Bolick painted many portraits during his career. As Bolick painted Portrait #24 he wanted to capture an emotion of sadness mixed with serious determination. It s a portrait of a young street fighter from Nicaragua named Rique. Bolick probably painted Rique due to the fact that he was a young man who lost every fight but with intense determination, he never gave up, no matter how hard the task ahead looked. If I could ask Rique a question it would be, Why would you continue to fight knowing you will lose? I cannot relate to Rique because I don t fight physically and I do not fight emotionally. I have it easy compared to others. I don t really like the feeling of Portrait #24 , but I do appreciate its message and painting style. The colorful splatter painting style is fun to look at and the way it is painted interests me. Also, the intense blue colors in the background make me think of the sea shore. My favorite part of the painting is the painted grey lips. I do not like the artist s choice of colors on the subject s shirt because I do not believe that they blend well with the rest of the painting. Portrait #24 portrays Bolick s talented painting skills and his ability to shade with many colors of paint. Behind every painting is a story. I believe the story and message of Dan Bolick s Portrait #24 is that someone may be stupid for fighting, but no matter what you want to accomplish, be determined and never give up.